I mean, I’ve candied them, I’ve made this soup out of them, I’ve even stuffed them in chicken. It would seem natural for me to want to do this. But it’s taken me this long – not sure why. What’s the core of this addiction, you ask? I have no idea. I want to pile them on nachos, put them on burgers, stuff them in quesadillas and sandwiches…eat them out of the jar. AND I like them hot, I never de-seed my peppers (unless I’m making them for Mark). I love the heat, I tell you – Hot. Yes, that’s a southern saying. You could say anything and add “and all get out” to it. Here kids- let me give you an example. Like how I school you on Southernism’s?? If you can’t take away something from this meek little blog, then I’m doing something wrong. Now, I am definitely not a Paula Deen, but there is some deep-rooted Southern in this girl. 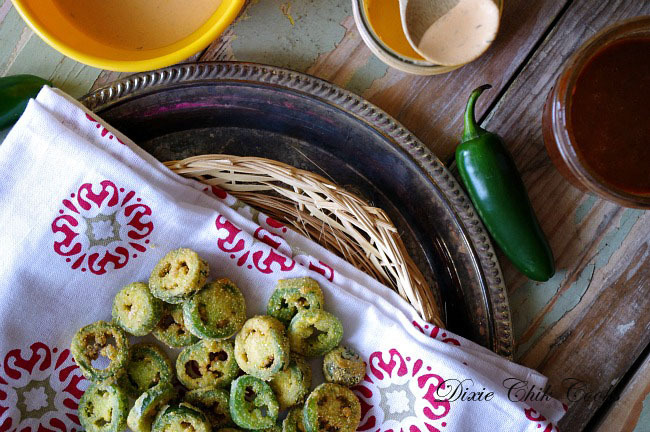 Slice jalapenos into coins and set aside. Whisk milk and egg together. Mix the cornmeal through paprika in a large bowl. Heat oil in a large dutch oven to 375 degrees (I had my heat on a little bit higher than medium-high). 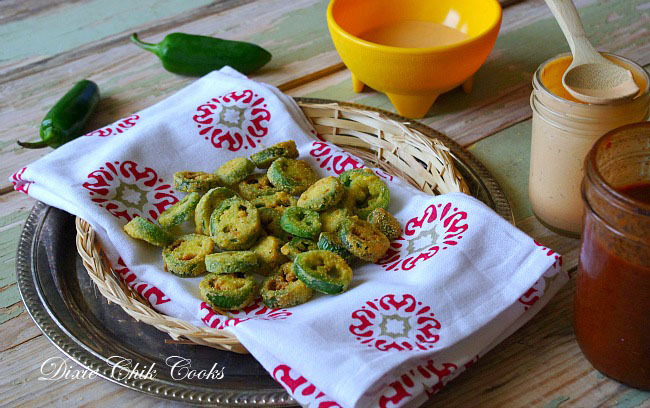 To fry the pepper slices, dip them in the milk/egg, then dredge in cornmeal mixture. Drop into hot oil for about 45-60 seconds a piece, give or take, transferring to a plate lined with paper towels to drain. 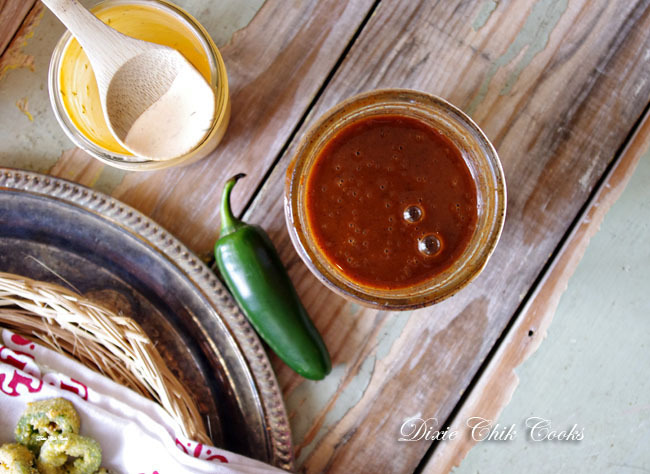 For the dipping sauce, combine ranch dressing and enchilada sauce. Ok, just so you know, the dipping sauce, as simple as it is, is just fantastic. Um, apparently my food has become manipulative. It’s smiling at me. I can’t help it; they had me at hello. Isn’t that cute? Doesn’t change the fact that I will inhale it. appetizers, fried, hot, jalapeno, mexican, spicy. Bookmark. I had these several months back at a restaurant and fell in love. I finally made some this past Monday. I took four and some seasoned fish fry mix and mixed some water in to a batter, dipped them in and then fried. Very good. Also did some banana and Chili peppers but just split them in half. They were all good. I might check things out. I like what I see so now i’m following you. Look forward to looking into your blog some more! 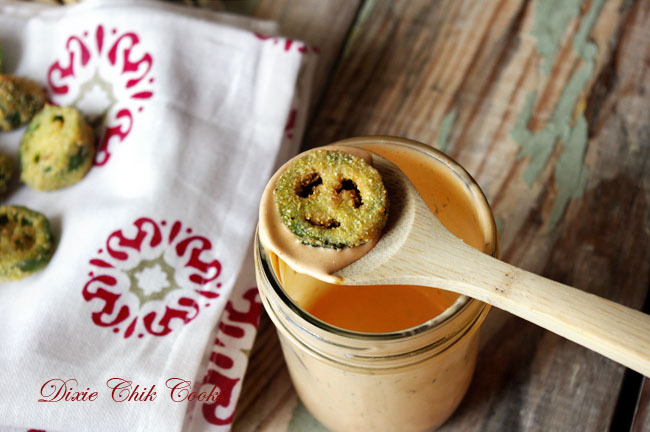 When I was a kid, my dad and my brothers used to TORMENT me with jalapenos. I hated them and I hated anything spicy. Now? Can’t get enough of them! Can’t wait to try this! Thank you so much for linking up with me this week at Tasty Tuesdays! I’ve pinned this & shared it with my followers! You are eating jalapenos? hahahaha…. funny I am! 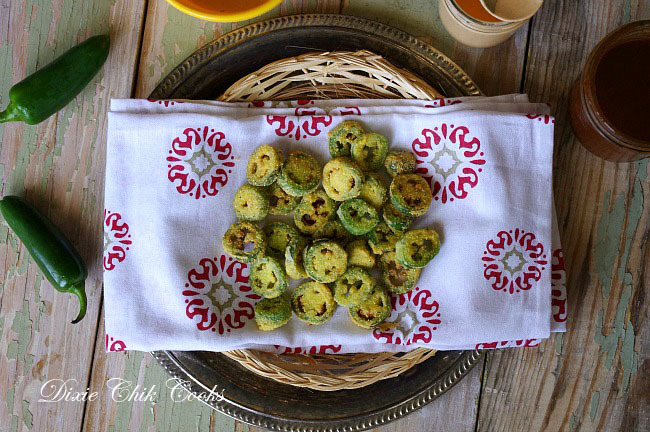 They made me think of fried okra – my Oklahoma step father use to make that – but I think these would be better with icy cold brewskis! Dont think we could stop eating these!!! Girl- You are a woman after my own heart! Love jalapenos too! Thanks for stopping by Debbie! !